We have discovered a way to make building a house in Panama much easier for you. We build the major construction elements. Which means you get to focus on adding all your own personal design details. The fun stuff that will make this home uniquely yours. Please read this entire page to fully understand what you will receive when you order a Living In Panama house. We are very excited about our new beach house. We are sure you will love it too. Keep reading for more details on each of these simple steps – and more about the Living In Panama House, and your final expected cost. 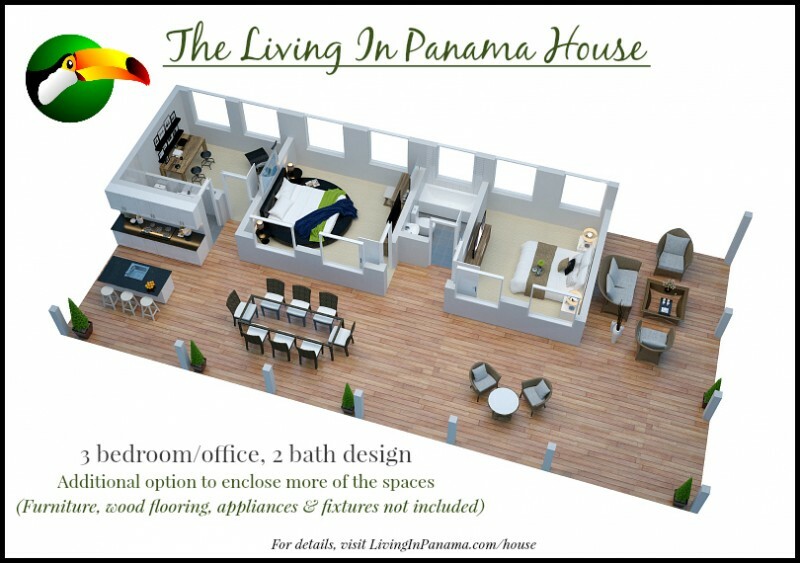 Why Buy A Living In Panama House? Building From Scratch is Overwhelming. We created this house to meet the demands of our clients. Many people we speak with are overwhelmed by the idea of building a new house on raw land, especially in a foreign country. Expat buyers can more easily understand purchasing a “fixer” house, even if it needs of a lot of work. This is the main reason why so many folks end up buying an existing house to remodel. Understandable. Even if you haven’t remodeled before, it is likely that you know someone who has. Availability. In our area, there are almost no new houses for sale. Often, what appears to be a simple remodel, ends up being an expensive and frustrating experience. Extra time, and stress; An ill-conceived remodel can drag on a long time, and you won’t know the final completion date, or the final price tag, until the last coat of paint has dried. With the Living In Panama House you get the benefits of buying a remodel, but without the potentially expensive downside of hidden problems and poor quality that often come with buying an existing house, particularly in Central America. Our Living in Panama House is brand new. It isn’t a remodel. Your finish work is essentially customizing a new house. Flexibility and Choice. You choose where we build your new beach house: Many lots to choose from. You choose your model (2 or 3 bdroom), paint & roof color, whether to enclose more space, etc… You select your finishes. Control your own Budget. You choose the pace of your cash outlay. You can lock in a great investment in our fast-appreciating real estate market, yet postpone completion of your home until you are financially “fit” to do so. D o the finishing touches yourself, and save even more, or hire one of our recommended contractors. Design consultation. Have a question about your design wish list? Reyn is available for free design consultations. Low Price. 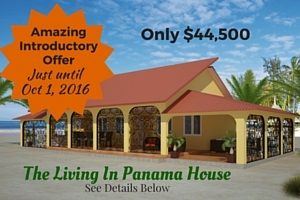 You can buy a Living In Panama House for only $44,500 – Offer good until Oct. 1, 2016. We will always offer the best quality and value in Puerto Armuelles. Strong design concept, based on our clients’ needs. By using standard architectural plans, construction time and budget are reduced, and are more predictable. You do the finishes. The biggest variable in the cost of custom residential construction is the client’s choice of finishes. You are in control of this phase of your project. We are available to help you. Obviously, If you choose to install top of the line appliances, expensive tile, and custom windows, your costs will be greater than those of someone who chooses more modest finishes. There are great home centers in nearby David, with materials similar to those found in the US, and some that are even more interesting. There are tons of finish products to choose from, in all price ranges. A tight budget needn’t limit the “wow” factor of the completed house. 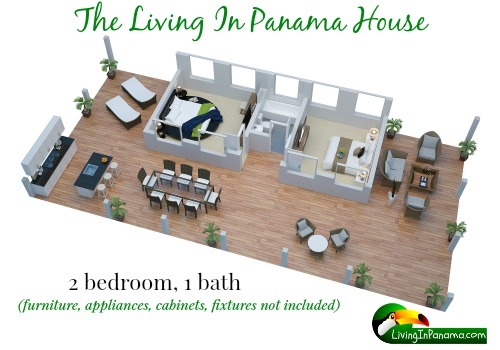 With the Living In Panama House you are in charge of the final cost. Maybe having a high quality gas range is very important to you, but you are fine opting for standard quality windows? Maybe the opposite is true? You set the priorities. You determine the final cost of your home, by the choices you make. You choose the timing of the finishes. You can postpone some (or all) of them, do them yourself, hire a contractor, or serve as your own contractor. We will walk you through the entire process. We will keep you updated on your home construction, through email, photos and video, and phone conversations. Our assistance does not end when we hand over your Living In Panama House to you. List of contractors as well as skilled craftsmen and unskilled laborers to help you finish your house on time, and on budget. Our Goal is for you to have a successful construction experience and to love your new home. Both models are 1500 sq. feet, all on 1 floor. Ample floor plan allows you to get comfortable and enjoy life. But not too much space to clean, furnish, and maintain. Over time, if you discover that you need more room, this type of construction is easy to add to in the future. This introductory offer is available only for houses ordered by Oct 1, 2016. Enclose more space. As you see in the images above, the difference between our two models is that the 3 bedroom model has more space enclosed by solid walls, than the 2 bedroom version. Plus the 3 bedroom has an extra bathroom. You can decide to enclose even more space – in either version – It’s up to you. Please note, more materials and labor are used when enclosing more space, so the final price tag will increase accordingly. We are happy to explain in more detail, when we talk to you. You can also tell us the paint colors and roof colors you want to use. But there’s no need to make those decisions at the time of ordering. This house lets you both enjoy Panama’s natural environment in comfort. Our Living In Panama House starts you off with the superstructure of the house. Interior/Exterior structure: The structure, including walls and columns will have a smooth, floated, concrete stucco finish. Plumbing: City water supply delivered to house. Obtain plumbing permits. Install rough-in: In-wall and In-floor plumbing. All pipes pressure tested and inspected. Everything is set for installation of fixtures. Electrical: Electrical wiring plan. Electrical permit. New electrical meter. City electrical power delivered to the property. All in-floor and in-wall conduit, outlet and switch boxes installed. All ready for you, or your electrician, to install your wiring, plates, fixtures, etc. Concrete floor: We provide a top quality, 4” plus thick concrete slab. We use only the best materials available in Panama (no local river aggregate (“ripio”) as many contractors here use to save money). Our level and thickness tolerances are also the best available, rarely more than plus or minus 1/4″ from dead level. This will make the tile contractor’s job much easier, of better quality, and far less expensive. This eliminates the necessity of shimming the legs of your furniture (common in Panama). Concrete slab will be ready for you (or your contractor) to install the floor covering of your choice. Insulated Roof: Ample roof overhangs and quality roof insulation, provide shade and heat protection from the sun. Structural steel supports are topped with high quality, standing seam, corrosion-treated metal roofing. Available in a variety of colors. This type of roofing is more expensive, but worth every penny. It provides the roof with long lasting protection from the elements, including sea air. Paint: All interior and exterior walls are primed and painted. You choose your paint color. How long you take to do the finishes, and the cost, are up to you. We will leave the finishes, such as tile, cabinets, doors, windows, appliances, fixtures, and trim for you to choose. Be Your Own Contractor – If you have the skills and temperament. (We have a list of sub-contractors and laborers). Whichever option you choose, you will be happy to know that there are skilled contractors and tradesmen available, as well as affordable unskilled laborers for you to choose from. Fortunately, as Puerto Armuelles continues its rapid growth, and becomes a destination of first preference among expats, there is a parallel arrival of qualified builders from areas such as Boquete, and David, where the building boom hit earlier. And of course, our own local builders in Puerto Armuelles continue to gain experience, by working with expat builders and clients. Now, more than ever before, there are a number of local contractors and tradesmen capable of building to the standards that the expat market demands. As this pool of talented workers continues to grow, finishing your new home has become far less of an “adventure” than it would have been, say, five years ago. Today, there is a high likelihood that you will be very happy with the results. You can finish your house yourself. Obviously, if you have the skills to do the necessary finish work, you will save the most money. Remember, hiring laborers in Panama is very inexpensive. You will probably want to hire some laborers to help with the heavy tasks, and those that you don’t want to do. If you have the skill set, and temperament to be your own contractor, you can simply hire skilled and unskilled laborers to work with you. You will save a bundle this way. Laborer – $20 per day. This includes your payment to us for the house. In other words, to complete the final home, with all the details, you would most likely spend $42 – $56 per square foot. Of course, your final cost depends upon the finishes you choose, and your contractor. In other words, this puts the fully completed home price at between $52 and $72 per square foot. Where do you want us to build your new beach house? 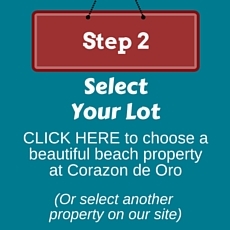 We are lucky to own one of the most beautiful properties in Puerto Armuelles– Corazon de Oro. 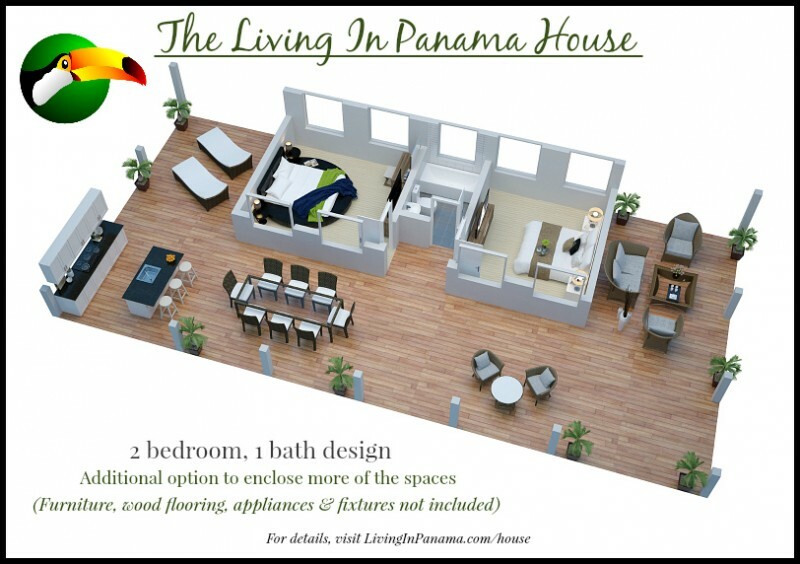 Feel free to have us build your Living In Panama House on any of our other beautiful properties. As you will see on our real estate page, we have many other properties. 100 yards (or less) from the beach. You can see these properties in a downloadable pdf as well. 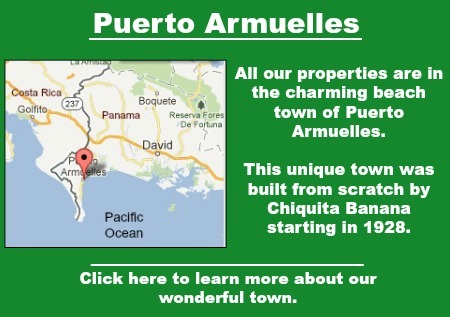 You can download our Puerto Armuelles properties pdf here. 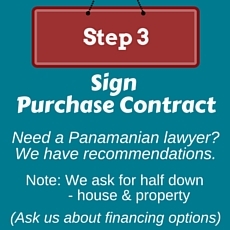 It is recommended that you have your Panamanian lawyer review any contract, before signing it. If you don’t have a lawyer, we can recommend one from our list of preferred lawyers. You can also look on the Panama forums for recommendations. You do not need to be in the country to sign or pay for the property. Your lawyer can help you with this. We can assist you with details, advise you on what you will need to do. If you have not been to Puerto Armuelles, or are not quite ready to make a big down payment, you can reserve your property. If this is of interest to you, please contact us. We are still determining the details of this option. 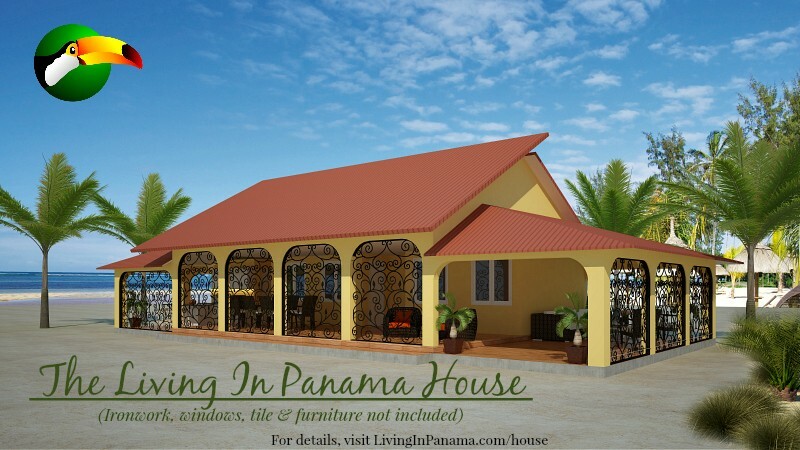 Click to start ordering your Living in Panama House. We have the skills, experience, and crew to successfully build these homes. For over 20 years, Reyn Vayda of LivingInPanama.com, owned a successful design/build firm in Seattle. In the late 1980s, Reyn attended the graduate school of Architecture at the University of Washington. In addition, Reyn has intimate knowledge of how to get things done in Panama as quickly and efficiently as possible. 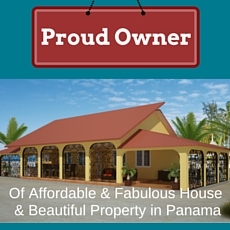 He has been developing properties and building projects here in Panama for over 9 years. Betsy Czark has practiced for nearly two decades, as a housing planner, in government, in the private sector, and as a freelance housing consultant. Betsy has a wealth of experience working with clients, builders, and architects in residential housing development. Betsy Czark is also the author of the Washington State Historic Preservation Plan. Our homes embrace life in the tropics and at the beach. Living In Panama Houses are designed so that you can hear the birds, the ocean waves, and enjoy the beauty of nature all around you. The Living In Panama House is comprised of 60-70% passively cooled spaces. What makes this home passively Cooled? What are the Unexpected Consequences of a Fully A/C Home? Until you experience it, it can be hard to realize how living in a fully air conditioned house can negatively impact your lifestyle, especially in our beautiful area. Isolation from the sounds of many wonderful tropical birds, ocean waves, and more. Reluctance to leave the artificially-cooled air & venture out into the comparatively hotter out-of-doors. Difficulty in noticing that a friend has dropped by for a visit, visitors cannot be heard above the sound of the A/C within the closed up house. This is especially true if privacy fencing prevents people from knocking on your door. Some areas of our Beach House are designed for full, artificial, climate control (e.g., bedrooms and media room/office). Even for the purist, sometimes in the dry season, it can be too hot, and one needs a little break. Although, for some folks, the cool ocean breezes, which are always strongest in the hot dry season, cool sufficiently. This is especially true in our houses, which are designed to take full advantage of these refreshing breezes. Particularly clients from warmer climates, may find there is no need for air conditioning at all. Our family uses only natural breeze in our own home in Puerto Armuelles (We are from cool and rainy Seattle). We do use electrical fans, especially in Betsy’s office and the bedrooms. 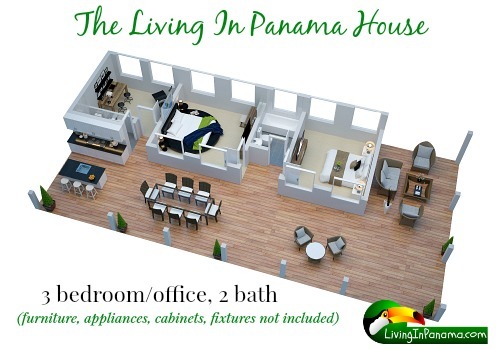 If a Living In Panama House fits your needs, we are thrilled. It will be a fun & satisfying adventure for all of us. We have tried to make this as easy as possible for you . W are here to help you every step of the way. You can order your house here.